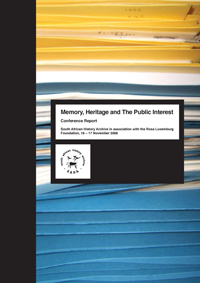 Report on two-day conference, organised in 2007 by Nelson Mandela Foundation and the University of the Witwatersrand, with the support of the Minister of Arts and Culture, to assess the state of the national archival system and the vitality of the broader archival sector. Site aimed at supporting the ongoing development of archives and heritage in South Africa. Site includes lists of links to South African archives, heritage organisations and museums, as well as information on archival publications and projects. Website of the National Archives and Records Service of South Africa. This body was established by promulgation of the National Archives and Records Service of South Africa Act (Act No 43 of 1996 as amended). This Act provides for: a National Archives and Record Service; the proper management and care of the records of government bodies; the preservation and use of a national archival heritage; and to provide for related matters. Online guide to anti-apartheid movements archives documenting international solidarity in the struggles against apartheid, compiled by the Nelson Mandela Foundation. In 2008 the International Institute of Social History (IISH) acquired an extensive collection of archival materials relating to the anti-apartheid and Southern Africa solidarity groups in The Netherlands. Publication on human rights documentation developed by the International Center for Transitional Justice's Documentation Affinity Group. Free to download. Blog showcasing resources for human rights research at the University of Connecticut at Storrs. Virtual space created by the International Council of Archives for professionals working in the field of human right archiving and documentation to share information, resources and experiences. Digital library of collections of peace agreements and truth commissions materials from the United States Institute of Peace. 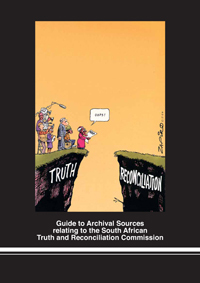 Excellent annotated list of links to resources, tools, videos, and information on both human rights on archives and archiving, posted on the WITNESS blog, The Hub, in October 2009. Archival arm of WITNESS, aimed at collecting, documenting, preserving and providing access to audiovisual human rights media in the support of advocacy, prosecution of justice, truthtelling, and the historical record. Report on conference about refiguring, utilising and improving access to archives in South Africa.